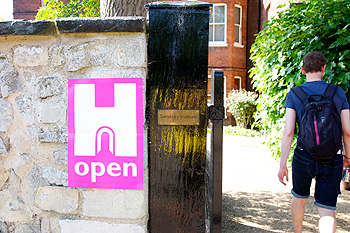 On a balmy Saturday morning in early September we opened the doors of the Norwich headquarters of the Sainsbury Institute for Heritage Open Days, a chance for the public to access historic buildings which they cannot usually enter. For my colleagues of the Sainsbury Institute (most of whom were not around when we moved into 64 The Close in the autumn of 2001) and me it was an opportunity to rediscover some of the traces of the history of this lovely old building embedded in its very fabric. Heritage Open Days is an initiative that has been running for a number of years now, and the over 200 sites for Norwich and the surrounding areas are currently coordinated by Norwich Heritage and Economic Regeneration Trust (HEART), making this region’s Open Days the largest such event outside London. What we now know as 64 The Close comprises two main elements. The oldest part of the building dates back to the 12th century, when the area we use as the main office and the Library store, full of roller racking, was part of the southern range of the outer cloister of the Benedictine monastic complex that was an integral part of Norwich Cathedral. To the north still stand a series of round flint pillars, all that remain of the covered portico which once opened onto the outer cloister. The tops are just visible if you stand in our small courtyard garden, on the other side of the beautiful flint wall. It was a hall-style building, with tall perpendicular windows, parts of the carefully shaped stone casements still surviving and, thanks to the meticulous renovation work undertaken prior to the Institute taking up residence, now once again visible. The first floor was only installed once Henry VIII’s Reformation saw the building, along with so many other religious buildings in England, fall into private hands. The new owners installed a fireplace in what was originally the upper part of one of these perpendicular windows, and the massive timber, maybe recycled from a ship, and neatly laid diagonal arrangement of thin red Tudor bricks, now frame what is one of the most eloquent aspects of the archaeology of our building, just outside the door to our main offices. Heading down the back stairs and into the corridor that leads to the courtyard garden, we can see what happened to the lower part of the window: more timbers, included some elegant turned uprights, were inserted into the original stone casement, and would have let daylight into the newly created ground floor. Archaeological work was undertaken by the Norfolk Archaeological Unit (now subsumed into the County Council’s privatised property management services) as part of the refurbishment of 64 The Close. The plan they produced gives a good idea about the early life of the building. This part of the monastic complex was probably the Infirmerer’s Camera, as close as the monks got to a doctor’s surgery. Running underneath, and now housing the machinery needed to keep the lift running and the building warm, was a spectacular brick-built medieval drain, which helped keep the low-lying Cathedral Close dry and free of flood. Our more intrepid Heritage Open Day visitors made their way carefully down the ladder beneath the disabled toilet to see what can still be made out of this remarkable structure. 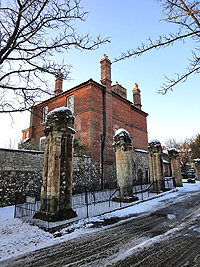 At the same time as 64 The Close was being refurbished through the generosity of Lord Sainsbury of Turville for the use of the Sainsbury Institute, comparable works were being undertaken in the adjacent range of buildings to the west, now 63 The Close. There is still an adjoining door – although it has not been opened since it was locked back in 2001. After some investigations, the keys were located and we were granted access by the Cathedral to a small office, up several flights of twisting stairs. 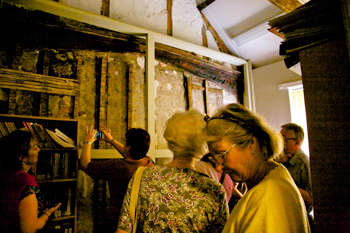 The present incumbent had very kindly removed the bookcases and their contents and a series of painted wooden panels to reveal a true hidden treasure: the remnants of wall paintings, dating to the 16th century, perhaps the first interior decoration of the building after the Reformation. Dark spirals and other abstract motifs can still be picked out on the plaster, framed by carved wooden beams bearing heraldic shields and a Tudor rose. 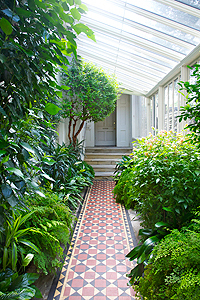 Returning down the stairs and back into number 64, we came out into the new part of the building, with its magnificent tiled floor, grand staircase, Victorian conservatory and reading rooms. These rooms would have been the reception rooms for the family who lived in the building from the 17th to the 19th centuries, and now house the Lisa Sainsbury Library and the library of the Norfolk and Norwich Archaeological Society. We had a glimpse of the structure of these later extensions in the course of an outbreak of dry rot a few years after we had taken ownership: bricks, lumps of clunch, huge timbers, all jammed in higgledy-piggledy and concealed with layers of plaster. In its later life, 64 The Close became a lawyer’s office, and the room now occupied by our Librarian, was previously the office of Norwich’s only blind solicitor. 64 The Close provides a wonderful example of Medieval and later buildings’ archaeology. Knowing something of that history enhances our appreciation of this splendid old building that was brought back to life to house the Sainsbury Institute. Each day I work here I am very aware of how lucky we are to have such a remarkable working environment.